Susan Cragin and I wrote Deemer On Technical Analysis is 2011. It was published by McGraw-Hill in February 2012. Here's the Preface from the book and the jacket copy to give you an idea of how the book came to be and what it's about. I've worked on Wall Street since I started at Merrill Lynch in 1963 - and I have been a full-time technical analyst since 1964. During that time, I've been lucky enough to have worked with - and learned from - some of the best technical analysts of all time. Some of them are household names, such as Bob Farrell, but others, although they were revered in institutional circles, are virtually unknown by the general public (e.g., Stan Berge). This book shares the lessons I've learned from the great teachers I've worked with - as well as some lessons I've learned myself through long experience. (Experience is the best teacher in the stock market, too.) The book is not, however, still another exhaustive treatise on technical analysis; others have already written them better than I ever could. Nor is it a complete book on investing. The space we had to work with was far from infinite, and difficult choices on what to include and what to leave out had to be made. But I think everyone, from seasoned professional money managers to the public investor, who deserves a lot more credit than Wall Street usually gives him or her, will find some illuminating - and, I hope, profitable - nuggets of investment wisdom in these pages. I've been thinking about this book for a long time, and as I neared retirement, I thought that its time had finally come. I desperately needed someone to help me write it, though, and Susan Cragin, the wife of a money manager I knew through some mutual friends and already a published author ("Nuclear Nebraska"), said that she'd be interested in coauthoring it. Our original title was Don't Call It Luck - but I was very, very lucky to have had Susan to work with; without her, there would be no book. Today's volatile markets are challenging for professional and retail investors alike. Just in time, Walter Deemer, a cornerstone of the financial markets for nearly 50 years, has culled his insight and knowledge to show investors how to achieve steady investment gains in the current financial markets. In Deemer on Technical Analysis, Walter distills his decades spent on the frontlines of the financial markets into a useful strategy book that shows you how to time the markets to successfully grow wealth. The key is solid technical analysis. Inside, you will learn the nuts and bolts of charting, identifying indicators, recognizing trends, and selecting the best stocks for your investment goals. Effectively use the long-term timing tools preferred by top experts, including investor sentiment, relative strength, and trend recognition. To enhance the hard-won financial advice and proven timing techniques inside, Deemer on Technical Analysis also weaves in entertaining and clarifying anecdotes from the author's colorful life working at prestigious firms, where he rubbed elbows with A-list icons of Wall Street. Each one reinforces real-world applications of covered material to help you more effectively seize opportunities in the financial markets. From his early days with Bob Farrell at Merrill Lynch and Gerry Tsai at the Manhattan Fund to his years as head of market analysis at Putnam Investments and President of DTR, Inc., Deemer has been dispensing timely advice exclusively to top figures in the field. Now, in his quasi-retirement, this technician's technician has written a book that levels the playing field, so that you too can invest like a pro. Walter Deemer is a legendary stock market analyst with nearly half a century of distinguished experience and a remarkable financial record of accomplishment. In Deemer on Technical Analysis, author and Wall Street legend Walter Deemer shares his sage advice and personal anecdotes from a long and illustrious career to help investors achieve their goals of financial security by studying and timing stock-market cycles. This indispensible book is more than half-a-century in the making and is filled with all the thoughtfulness and genius of a true captain of his discipline. Start your own trend toward greater wealth today with Deemer on Technical Analysis. "Deemer on Technical Analysis will become an instant investment book classic." "Walter Deemer on anything would be an interesting read, but Deemer On Technical Analysis is particularly special because of his uncanny ability to bring to life an often overlooked segment of stock market research. Serving on the front lines of this investment discipline for the past 40 years with some of the most influential investors of our time, Deemer provides a front row seat on some fascinating history, rich with insights and anecdotes and, of course, loaded with wisdom. His true gift is making the arcane world of technical analysis accessible and relevant to all investors. If Warren Buffett is the Oracle of Omaha, then Deemer is the Prophet of Port St. Lucie." "I have had the great pleasure of working with and getting to know some of the greatest Technical Analysts throughout the past fifty years. Walt Deemer is widely recognized as one of the best. His charm and wit in explaining the keys to successful investing will make this book a must-read and an all-time classic for first time investors and professionals alike." "Every investor can learn something from Walter Deemer." "Flash crashes, High-Frequency Trading. Delta One Desks. Derivative Daisy Chains. Today, more than ever, there's no such thing as an even playing field in Wall Street. With giant endowments and mutual funds still licking wounds inflicted by the financial crisis, individual investors seem ineluctably over-matched. And they are, if they persist in playing by their brokers' rules. But there is an alternative, one found at the uncommon intersection of common sense and the application of timeless principles of technical analysis to new market realities. 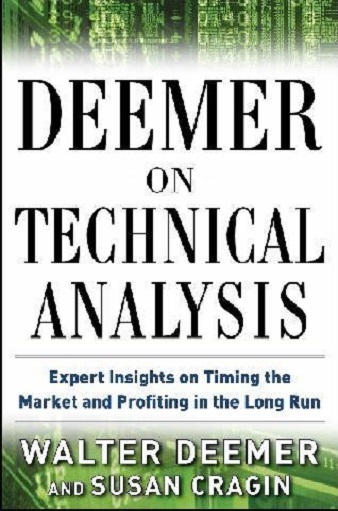 Walter Deemer, who spent his entire professional career quietly advising some of the most successful mega investors of the '70s, '80, '90's and Awful Aughts, has done the investing public a huge service by spelling it all out in his new book, Deemer on Technical Analysis. There is more plain-spoken inveterately contrarian stock market savvy between the covers of Walt's new book than I've read in a lifetime of perusing market books. Even better, Walt leavens the learning with often humorous and always instructive anecdotes, many of which offer a peek at the human side of the presumptively high and mighty. My only quibble is that Walt should have called it: Deemer Demystifies Technical Analysis (and Making Money In Stocks!)." "Technical analysis is the architecture of finance, part art, part engineering. Like Wright and Gropis, Deemer is unshakable in his quest for enduring quality forecasts built on a foundation of market history, a philosophy of contrary thinking and the strength of working with the largest of institutional money-makers. You want to carry him with you when you enter today's market house." 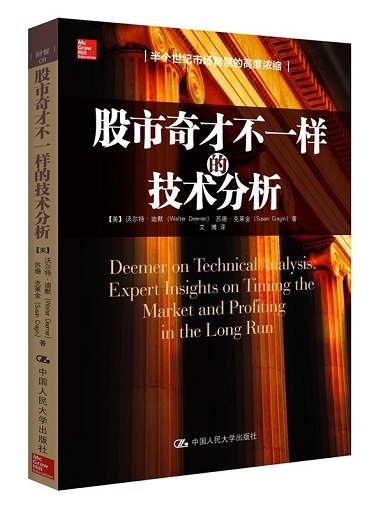 Deemer On Technical Analysis is available in both a print edition and as an e-book. The print edition is available at your local bookstore. It's also available through Amazon and on iTunes. The e-book version is available through Kindle and iTunes. It's also available in Chinese!